Our apps are updated as needed to fix bugs, features, or performance, and maintain compatibility with changes in OS X and web browsers. When an app is updated, it gets a higher version number. For example, version 1.2.2 may be updated to 1.2.3. Any given version of our apps, say, version 1.2.3, never changes once it is published. Although we have a good testing regimen, it is always possible to introduce new bugs. Most updates are therefore intnroduced on the Beta channel and, after a week or two, are graduated to the Stable channel. Alpha is used when we think that the risk is higher than normal. 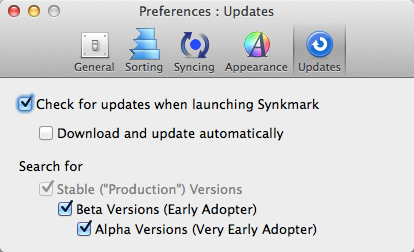 We appreciate users who opt for the Alpha and Beta channels helping us finish our testing and release quality updates. A user opting for Alpha and/or Beta updates will typically get updates thrice as frequently, maybe every 1-4 weeks, compared to a user on the Stable update channel, maybe every 3-12 weeks. Updates are more frequent during late summer, when we are preparing for new releases of OS X. New releases on the Stable channel are announced on MacUpdate. • If you do not have the subject app already installed, do so by downloading from one of the links on the right. • Follow further instructions which shall appear.